It might be the world's most simplest recipe, but it is still a recipe. I am talking about the very basic bread and jam sandwich. The best comfort food ever. This is a wonderful travel food, specially for people travelling with kids. Young chefs (kids) love to prepare these sandwiches. Spread the jam on one side of the bread. Place another bread slice on top of it. It is optional to cut off the sides of the slices. Cut it diagonally and enjoy this simple, delicious comfort food. 1. 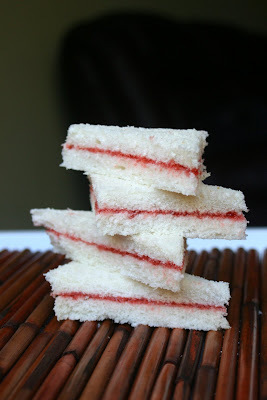 Peanut butter and jam sandwich: Spread jam on one side of the slice. Top it with another slice. Then, spread peanut butter. Top the peanut butter with another slice of bread. 2. Bread butter jam: Spread jam on one side of the slice. Top it with another slice. then, spread butter. Top the butter with another slice of bread. 3. You can do any of the above after toasting the bread. This is my entry to Eat Healthy - CALCIUM Rich hosted by Sangeeth of Art of cooking Indian food. Bread is a good source of Calcium. Nice........ I like this simple sandwich. Will have it any time. It might be simple but it is a very helpful recipe.Thanks for sending it to EH and loved the pic. I love the peanut butter sandwich with jam on it, my daily favorite. Awesome man! GReat pic you have used to illustrate!